Matthew Cove's Food Projects Blog. A record of my adventures in food, raising our own animals, baking bread, building a wood fired oven and other food experiences that I would like to share. Exciting day today in the storey of building our wood fired bread and pizza oven. The first hurdle was to make a safe exit for the exhaust gases from the bakery. This required a double walled insulated stove pipe with a flashing to stop the rain and snow coming in. None of this was available so we fabricated our own. 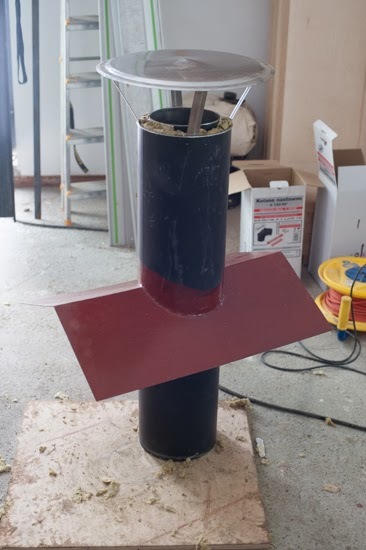 Using two different diameters of stove pipe made from 2 mm mild steel, 160mm and 200mm diameters, the inner pipe is wrapped in high temperature, foil faced mineral wool. We bound the mineral tight to the inner pipe by wrapping it in thin mettle wire and with a bit of teasing the 200 mm pipe squeezed over. 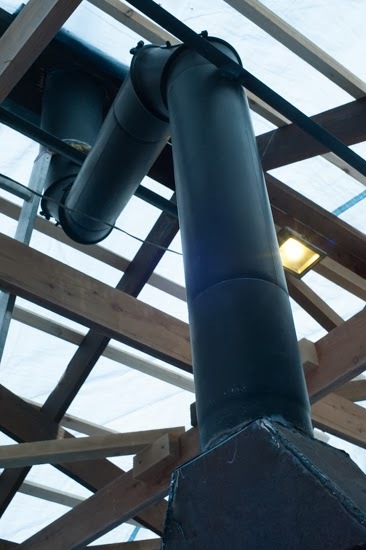 The outer pipe has the flashing welded to it at the correct angle for the ridge of the bakery roof. 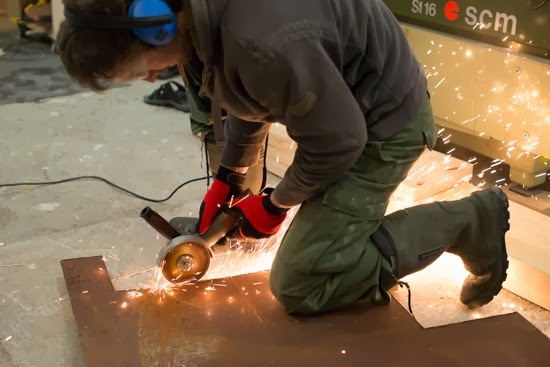 The flashing we cut out of 2 mm steel sheet. The whole thing was then cleaned up with a wire brush attachment on the angle grinder and painted, first with rust resistant primer and then a black finish coat. Today we also took delivery of the Perlite that we will be using as a loose fill insulation around the oven. 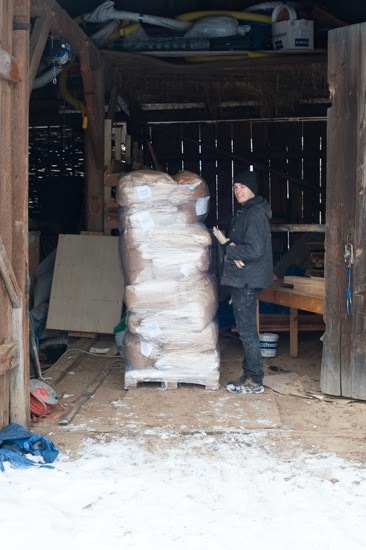 As the delivery charge was initially more than the cost of the perlite, I decided to get a whole pallet, about 1500 L, about a hundred pounds. More than we need, but maybe I will start growing plants in this stuff in the spring. With the flashing painted we could then complete the remainder of the work on the chimney. The path the chimney takes was done so that the minimum distance between any hot surface and and flammable material is 450 mm. With the chimney completed and my parents arriving today ready for our daughters 1st birthday party on Sunday, I could not resist the temptation of have a practice run. 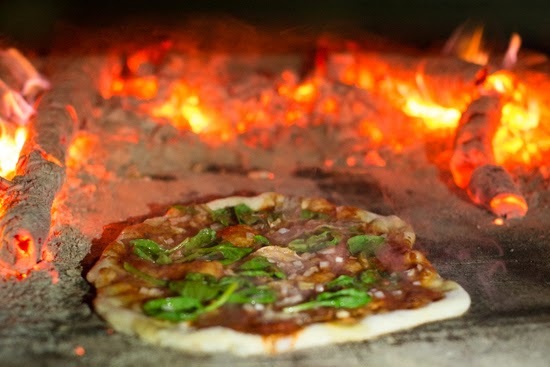 As mentioned in a earlier blog post, a couple of weeks ago, I promised that that oven would be ready in time to cook pizza for the party guests. At times I thought we would not get everything ready, but by getting help from Damian, we are just about ready. 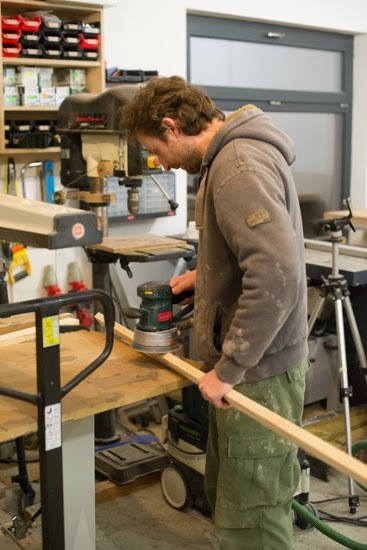 Last minute fabrication of a peel, handle of rough cut wood, smoothed to remove and splinters with an orbital sander. 2 mm steel paddle cut out with an angle grinder. Stainless would have been better, but I don't have any laying around. Cleaned up with the wire attachment and then treated with vegetable oil and heat. This is my first time making pizza, but I know the basics. Really hot oven with the embers still sitting around the edge of the oven. I made a simple dough similar to my focaccia recipe here, but not as wet and as I had not time to mess around, instant yeast was used instead of sourdough. 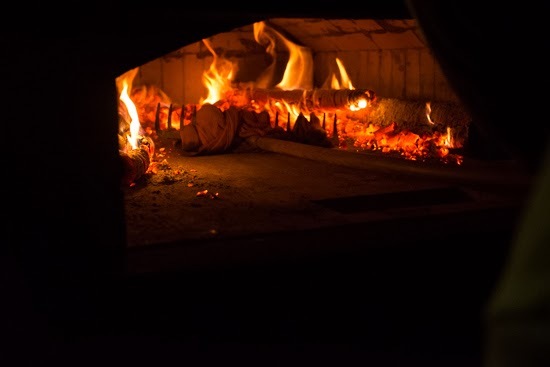 After firing the oven for a couple of hours the embers were pushed to the sides and the hearth, mopped with a wet cloth wrapped around a garden rake. 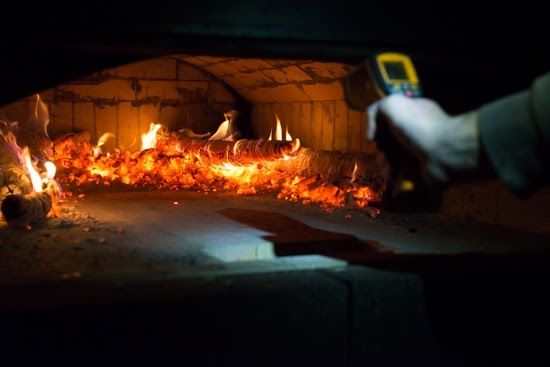 The temperature of the hearth at this point was around 500 °C. A tomato sauce I have used is half good quality tinned tomato half passata. Lots of garlic black pepper and a glug of balsamic vinegar, simmered for a while to intensify the sauce. 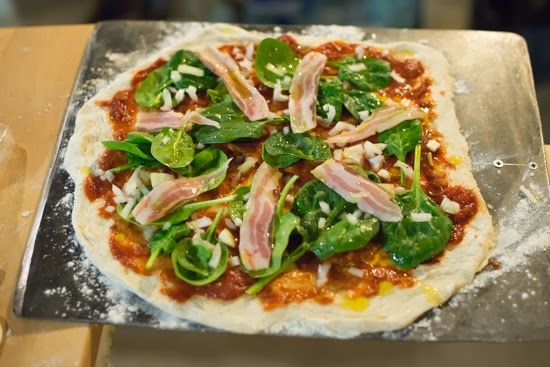 The first pizza was topped with home made air cured pork belly, onion and spinach. 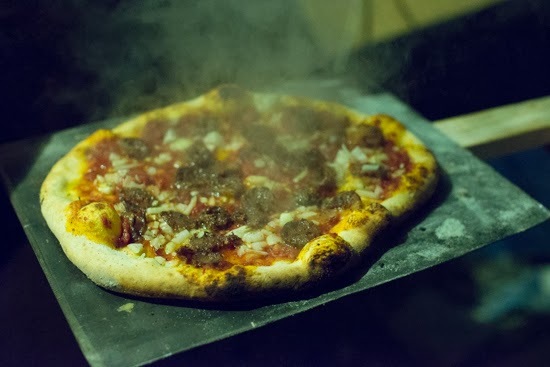 The second pizza was topped with home made chorizo, onion and black pepper. Had lots of fun finally using the oven that has taken so much planning and time to build. Next step is to bake bread on Saturday followed by a very large number of pizzas on Sunday. My Plans for a wood fired, masonry barrel vault oven.